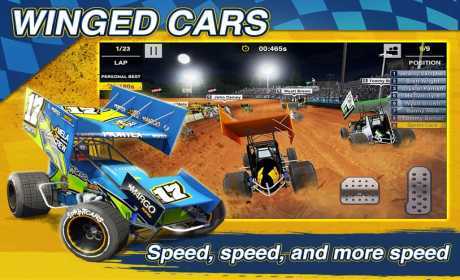 The long awaited Sprint Car game from the creators of Dirt Trackin’ is finally here! 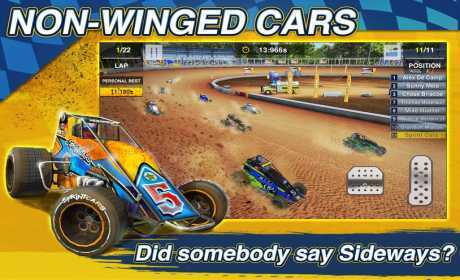 With 410 Winged, Non-Winged, and Midget cars, you’ll be sure to find all levels of competition. 6 Fictional tracks, covering different parts of the world. Real World Drivers in all 3 classes. Highly Competitive Multiplayer mode, race your friends, your foes, and see how you stack up against the best in the world! Career Mode: Race your way from the United States to Australia in a grueling 108 race mode, in which you must win each series to advance to the next. Simple, win and you’re in. Win your way through the ranks from Midgets up to Full Blown 410 Wing Sprints, and unlock rewards! Control your way: Choose from Arrow, Tilt, or a virtual touch steering wheel. Day/Night/Dusk racing modes, pick your time of day to race! Time to get dirty! 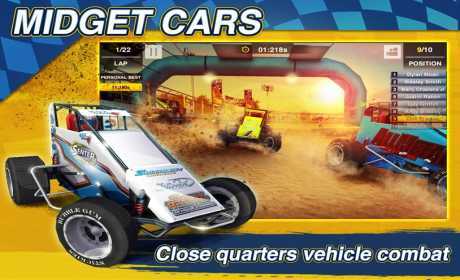 Your car will not only get mud splatter and you will need to use tear offs, but your car will also build dirt as you race, just as a real car would on the track. Stats tracking and XP. Track your stats throughout the entirety of your racing career, whether it be Single Player, Multi-Player, or Career, rack up your wins and top 5’s and track your overall skill progress! Earn XP points for races won, Career series completed, and big bonuses for completing career mode.